Q & A: Powede Lawrence – I’m passionate about achieving set goals, I’m not a quitter. Powede became a beauty queen for the first time in 2009, representing her university, Niger Delta university in the miss university Nigeria pageant which she won, a year later she represented Nigeria in the Miss University Africa pageant, amongst 50 beauty queens from all over Africa which she also emerged winner. That gave her a platform to reach out and touch lives, she started charity by renovating a school for physically challenged students in Yenagoa, Bayelsa, and offering an annual scholarship to all the physically challenged students at her university. In 2013, Powede emerged the Most beautiful girl in Nigeria tourism, and started her eponymous foundation which has since then rendered help such as scholarships and care to the less privileged. Over the years, Powede has modelled part time and worked with both local and multinational companies, featuring in fashion look books, editorials and TV Commercials. Powede is a registered nurse and midwife, she also has a Bachelor of sciences degree in Nursing. 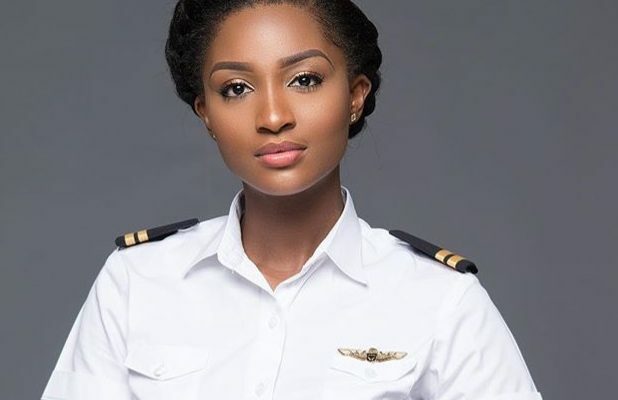 She worked primarily as a nurse before deciding to take to conquer new grounds in her career by taking up a training in the aviation industry and becoming a certified pilot. Nothing inspires us more than young women who consciously, constantly evolve to a better version of themselves and Powede is a walking and living example of that. I’m passionate about achieving set goals, I’m not a quitter. Powede is a vibrant, determined young woman, I can be as funny as I can be serious, I am forever an ardent lover of God. What inspired you to take the step towards being an Aviator? Growing up I lived close to the airport, I would watch aircrafts take off and land, the noise of a flying aircrafts was what I woke up to everyday. I was just fascinated by the science of flying and was looking forward to doing that not just as a passenger but as pilot in command. I prayed to God about my new career path and He is seeing me through. What are the necessary skills required to be certified “OK” to be in the field? To be a pilot, one has to be of a sound mind, soul, spirit and body together. In order to make rational decisions. You also have to be confident and brave. Physically, it’s important your senses are at optimum function, sense of sight, hearing etc. One also has to be physically fit. Basically, holistic health. A prerequisite of being a pilot is also a background knowledge of the basic sciences, maths, physics, biology as this will help in understanding the principles of flight and so many other aspects involved in the science of flying. Discipline, precision. punctuality and a good sense of communication are also required amongst other things. What was it like being in the modeling industry as a young woman and was modelling something you always wanted to do? I did my first modeling job for a calendar at age 5, so growing up it had become a part of me. The modeling industry might be tough if you don’t understand the concept behind it, it’s simple “if you fit into the brief, you’ll probably get it”. Like if a client wants a dark skinned girl for an advert and you’re light skinned, there’s no need to be sad if you don’t get picked, just try another time. Modelling has been my past time for more than a decade, it’s fun and a great “side hustle” too. My role model is: every strong successful woman who is not just successful in one but every aspect of their life such as family, spiritual life, career etc. As far as I’m concerned, success is a holistic term. The most important life lesson I have learned is that Love is a choice, a deliberate decision not butterflies in my tummy lol. My take on “women supporting women” is that a single woman can lend a voice, but together, we can resonate not only echoes but a movement. If you’re having a bad day for whatever reason, what gets you out of it? When I’m having a bad day, I listen to some good music, most times gospel to help me snap out of a bad mood. I’d like to be remembered as one who inspired young women to be better version of themselves and as one who attained success in all ramifications. Thank you so much for your comment Diamond. We are glad your vision is as sharp as ours. Love & Light! Doing the right work is all it takes to be successful. More grace Eniola!